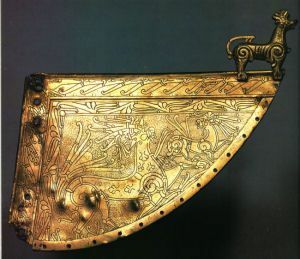 The Ringerike style grew out of the Mammen style during the first half of the 11th century. The style emerged at a time when the custom of erecting stone monuments was becoming more common and the style is named after a series of richly carved stones in the Ringerike district of Norway. One can see that the Ringerike style has developed from the Mammen style, although there are a number of significant differences: the animals are thinner and more curvaceous; their bodies are no longer decorated inside; the eyes are almond-shaped instead of round; and the tendrils get thinner and longer. A fine grave-slab decorated in the Ringerike style was found in the churchyard of St Paul’s Cathedral, London.